Inter Casino is one of the pioneers of the online gambling industry, having been established in 1996 and is managed by Dumarca Gaming Ltd. It is a popular brand for offering excellent casino games and promotional bonuses. The black-themed platform has the user-friendly interface that is easy and simple to navigate. The game lobby comprises of titles from developers like Evolution Gaming, Amaya, and Betsoft Gaming. Besides the games being available in free and real money modes, they can be accessed instantly through mobile and desktop browsers. Players are also presented with multiple bonuses, promotions and payment options. 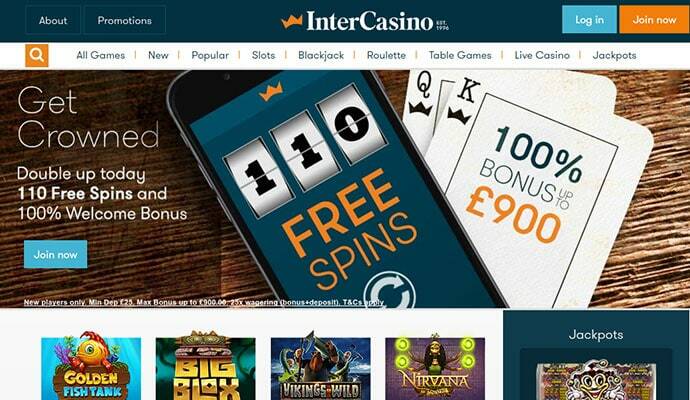 Inter Casino has built a good business relationship with the industry’s best-known software development companies who supply it with cutting-edge casino games. The developers also use HTML5 in designing games to make them load fast and smoothly on small screen devices like Android, iOS, Blackberry and Windows-powered mobile phones. Also, players enjoy high-quality graphics like in the online version. Some of these developers include Evolution Gaming, Thunderkick, Microgaming, NetEnt, Play n Go, IGT, NYX Gaming, and Amaya. The game lobby at Inter Casino consists of over different variations including table games, cards, video slots, video poker jackpots and the live dealer. Online Slots: Rabbit in the Hat, Gold factory, Game of Thrones, Asian Beauty, Flux, Volcano Eruption, Bloopers, Gemix, Alohal Cluster Pays, and Birds on a Wire. Table Games: Baccarat Pro, Triple Draw Poker, Super Wheel, Casino Hold Em, Mini-Baccarat, Roulette, European Roulette, Side Bet Blackjack, European Blackjack, Double Exposure Blackjack, Blackjack Classic and Punto Banco. Jackpot Games: Mega Jackpot Isle O’Plenty, Siberian Storm MegaJackpot, Cleopatra Megajackpot, Bell of Fortune, Treasure Room, Mr. Vegas, Treasure Nile and Wowpot. There is a welcome package for all players who sign up including a welcome bonus of 100% up to $300 on the first deposit. In addition, there is InterVIP which is reserved for the invited guests only. VIP Players enjoy benefits like personal assistants and holidays. Inter Casino has a good selection of withdrawal and depositing methods. Players can carry out all their transaction through Visa, Mastercard, Neteller, Skrill, Paysafecard, and ecoPayz. Players with questions can get in touch with the support assistant via live chat, email, and phone in English, Danish, Japanese, and German.